Hot Water Pressure Washers & Cleaners! Our fuel-powered models eliminate the hassle of using long extension cords. With access to a water supply, these high pressure water cleaners can simply get on with the task in hand, and can also be fitted onto a UTE or a trailer for convenient transportation. 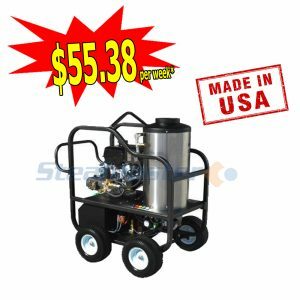 Steamaster provides a wide range of petrol and diesel engine powered Hot Water Pressure Washers and Hot Water High Pressure Cleaners for efficient cleaning around homes, offices, and large industrial sites. Our high pressure cleaners for sale come with steam cycle option, and are widely acclaimed for their power and mobility. These fuel-powered cold and hot water pressure cleaners are fully mobile and are powered with more efficient engines than their electric alternatives, which allows operators to work faster and for a longer period of time. They can also be used in areas where there is no readily available electrical source. When it comes to high pressure water cleaning, the equipment can get rusty, bearing irreversible damage. This is why we offer galvanized high pressure water cleaners for sale in order to prolong your investment. Designed to meet the highest cleaning standards, the equipment we offer cleans up effectively without creating unnecessary noise. These trailer mounted high pressure water cleaners are easy to maneuver. They also have everything that is required to perform high pressure cleaning around spaces with limited access. Steamaster is a reputed seller of high pressure cleaners throughout Australia. We believe in providing quality equipment at competitive prices. Since we have supplied high pressure water cleaners for over 20 years, we know our clients’ requirements and how to fulfill them. We strive to meet your requirements and make sure our product-range fully resonates with them. Give us a call now and we’ll respond promptly to any queries you may have.